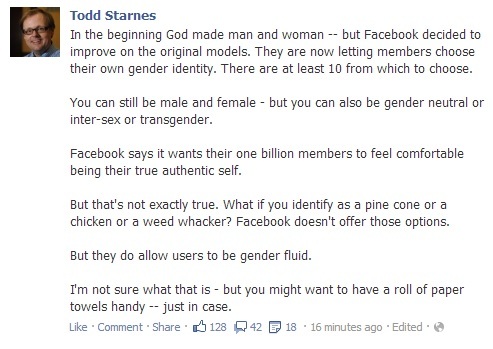 Fox News employees struggled to wrap their head around Facebook's decision to allow users to choose from a number of different terms to describe their gender, with one Fox News reporter asking "what if you identify as a pine cone?" Other conservative media personalities echoed Fox's criticisms, ridiculing Facebook's decision as frivolous and unnecessary. It's not the first time the network has mocked attempts to properly identify transgender people. In 2011, Fox & Friends criticized the Australian government for offering alternate gender descriptions in passports. The network has a history of proudly misgendering transgender people, so it's no wonder that Facebook's move to better accommodate the transgender community is met with bewilderment on Fox.